Disappointing Aug 04 2017 Update - 3 years later, all within the last 3 months, trouble began. Two of my D-Link DGS-1024A 24 port switches started to give me issues, with networking stopping entirely two separate times. A quick power cycle recovered the network, but not my confidence. A few weeks later, a few more ports suddenly failed, with no green LEDs for those failed ports. I moved the cables to different available RJ45 ports, back in action. Then finally, all in one day, two ports began negotiating 100Mpbs instead of 1000Mbps, one of them right in the middle of a router firmware upgrade video, making me have to start all over. That's it, I will be replacing all D-Link these switches in my home network. Oddly, things were great, until they weren't. My home didn't have any area lightning or other systemic issues that I can think of, with all PCs operating just fine. It's just 2 switch failures of 5 D-Link switches that I own in total, but what disappointing end to my ownership experience. I will be returning to Netgear switches, including the Smart Managed 5 port Netgear GS105Ev2 on Amazon, and the early 2015, LAG/aggregate capable Web Managed 16 port Netgear GSS116E on Amazon. Both enjoy 4.5 stars, more than enough time for Amazon reviewers to give me a good indication of the ownership experience here and here. NETGEAR ProSAFE® Click Switch™ for Ports Virtually Anywhere. The other nice thing about moving up in speed from my decade old Netgear FS108 10/100 switch? Well, I was using 10 watts for the above 3 devices, now with the DGS-1005G in place, I now use up only 2 watts. Nice! 8 watts saved, for 24x7 use, that's an energy savings of $12.58 a year (calculated here). So for my use, this $25 device will pay for itself in just 2 years! The DGS-1005G 5-port Gigabit Switch helps you conserve energy automatically through several methods. 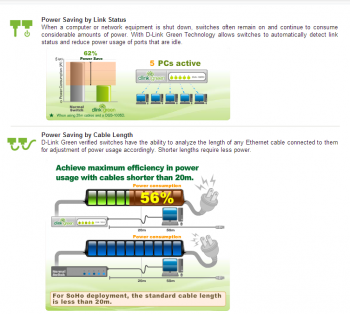 It automatically powers down ports that have no link activity, allowing the switch to save energy by cutting power usage for unused ports or ports connected to computers that have been shut down. It can also detect connected cable lengths and adjust power usage accordingly, helping you save energy without effecting networking performance. I find this LED illumination pattern adequate for my set-it-and-forget use of my D-Link 5 and 8 port switches, that are in out-of-the-way spots in my home. I've now picked up a D-Link DGS-1024A 24 port Gigabit Switch, and I'm equally pleased. It's the always-on switch that handles the "backbone" of my home network. 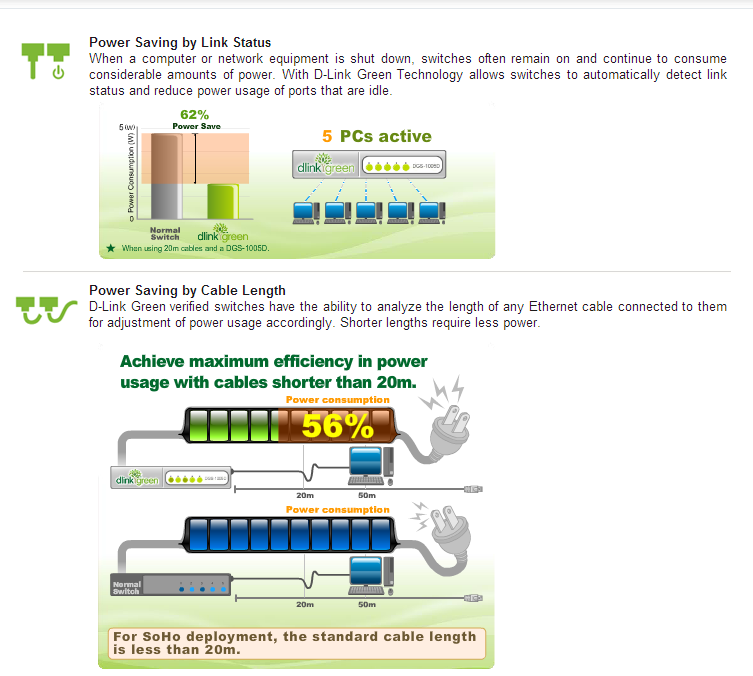 On the specifications page, you'll notice that 14 watts is the max this will ever use, presumably with 24 long cables attached that are all active. In the video I created below, I replace my 2 Netgear 16 port switches, which burned 22 watts total. They've been running 24x7, for about a decade. I simply moved the existing cabling over to the new switch, and I'm now down to just 7 watts total. Nice, a 15 watt savings! No throughput drop noticed on any of my attached devices. While I do wish the port # labels on the back were in a contrasting color, and above the top row of ports, that's nitpicking. For the most part, this device will just sit there for years, and rearranging the cabling for the nice pattern seen in the picture at right will make it easy to spot trouble that might arise someday, should one of those colorful groupings indicate a change. This project works out to a savings of about $24 per year for my household, calculated here. That's not counting the household cooling needed to compensate for the heat the old power supplies and units threw off, which could double my yearly savings. This new unit runs very cool to the touch. I'm admittedly a fan of devices that require no fan. Eliminating moving parts means fewer potential points of failure, and less noise in my residential setting. According to the Datasheet, the operating temperature is 32 to 104 °F (0 to 40 °C). Disappointing. 3 years later, all within the last 3 months, trouble began. Two of my D-Link DGS-1024A 24 port switches started to give me issues, with networking stopping entirely two separate times. A quick power cycle recovered the network, but not my confidence. A few weeks later, a ports suddenly failed, no LED. I moved cable to a different available RJ45 port, back in action. Then finally, all in one day, ports on two switches began negotiating 100Mpbs instead of 1000Mbps, one of them right in the middle of a router firmware upgrade video. That's it, I will be replacing these switches in my home network. Oddly, things were great, until they weren't. My home didn't have any area lightning or other systemic issues that I can think of, with all PCs operating just fine throughout these recent incidents. It's just 2 switches of about 5 D-Link switches that I own, but what disappointing ending to my ownership experience.